The Fountains at Boca Ciega Bay and Watermark for Kids have driven another child’s passion, this time galloping through new educational terrain in means of horseback riding and pure happiness. Elizabeth Backman, 17, loves horseback riding and it has played an important role in her growth as a young adult. 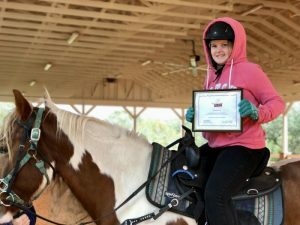 Watermark for Kids has sponsored Elizabeth’s equine therapy lessons for the next 6 months, and Elizabeth is now on her way to participate in the Special Olympics! An article was recently published on Tampa Bay Newswire chronicling Elizabeth’s journey, posted on Tuesday, March 13th, 2018. To read the full article, please click here.